Hi Folks. I have just published a collection of dot to dot puzzles for teachers and parents to share with their kids. I’ve been doing a lot of research into patterning and number sense, and this package of math activities is what has come of it. These are not your mother’s dot to dots. They are very intricate, going high into the hundreds. They count by 2s, 3s, 4s, and 5s, and they begin at different starting points. 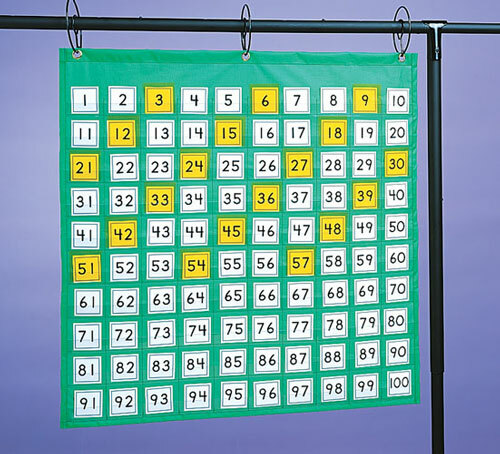 Students who I’ve tested these with struggle at first, but once they catch the pattern and focus, they solve the picture and learn the key ideas about skip counting and growing patterns, and develop some mental addition skills. The full package is available through TeachersPayTeachers.com. But here is a link to a sample Elf. Please enjoy, and if you like it, share it and the link to the package with any parents or teachers you think might enjoy it too. As part of a Math AQ course, I put together this Dos and Don’ts list for things to consider when working with students with autism. Many of the suggestions can be applied to more than math instruction. However, there is a saying amongst those who work with these children. “If you’ve worked with one child with autism, you’ve worked with one child with autism.” Generalizations about this disorder, thanks to the spectrum nature of it, are impossible to make. Therefore, when referring to this resource, keep in mind that, while these are pretty sound suggestions, the degree of application of any particular suggestion must be tailored to each child individually. In this list, the first Do corresponds with the first Don’t, the second Do with the second Don’t, etc. The downloadable PDF pairs them in columns. refer to general resources that support your math planning for students with ASD. get to know your student’s interests, because those will be the entry points to the math. make the math stimulating, fun, and interesting. use the same kind of differentiated methods of instruction as with other students. use visual aids and concrete materials to make the abstract real and accessible. break learning up into manageable parts. help the student to generalize math concepts and procedures. incorporate rote learning into your program: Many children with ASD are strong in this kind of learning. assessments that allow the student to be most successful in sharing thinking, playing to strengths. use precise praise for effort and success. assume the resource is definitive, e.g. most recommend visual aids, but some students with ASD are stronger auditory and/or kinaesthetic learners. be afraid to broaden the student’s horizons by introducing new things. over-stimulate, distract, or agitate the student: know the triggers and warning signs that tell you if things are about to take a turn. forget the communication skills such as vocabulary, and being able to explain the math, be it with pictures, numbers, or words. forget the hierarchy of visual aids: from most effective to least are real objects or situations, facsimiles or models, colour photographs, colour pictures, black and white pictures, line drawings, graphic symbols and written language. do the lesson without relating it to the other small parts and the whole. let manipulatives take on one fixed meaning or purpose: They are variable models that can represent many ideas. limit your lessons to rote learning: It’s important that this knowledge be connected to, and is in service of understanding the big ideas and concepts of math. forget to take the student’s weaknesses into account: be sure to consider stamina, mood, and external factors to decide when, how, and how much you assess at any one time. be stingy with the non math-based positive reinforcement that will foster a positive attitude and ideal brain state. Here’s the link to download the document. So, I was driving to work, listening to the CBC (Canadian Broadcasting Corporation – for U.S. followers), and they were talking about the Heartbleed bug. Well, they were actually talking about changing passwords, and how important it is to make them fairly complex, differentiated, and not in any way predictable or guessable. Of course, this level of complication makes passwords extremely forgettable. Wait. I want to digress a bit. Let’s play a game. This is how you figure out your Movie Star name. Your first name is the the name of the first pet you ever had. Your last name is your mother’s maiden name. My Movie Star name is Snoopy Masters. What’s yours? And while you’re at it, why don’t you just save me some time and tell me your father’s middle name, the street you grew up on, and your favourite fictional character, because clearly you want to be the victim of identity theft. Most webpages let you reset your password, or at least get a hint, if you can accurately answer a security question that you set up when you registered. You know what I mean. “What is the name of the first street you grew up on?” “What was the name of your first pet?” Imagine my shock when I heard the CBC hosts talking about how con artists set up these posts and threads, collecting people’s information with innocent little internet games. Not as advanced as the scene in Now You See Me, but just as effective. So, NO MORE “What’s your Rocker Name” games for me. Or you, I hope. Winnie is not your stereotypical picture book heroine. She is industrious, creative, and she has a penchant for slimy things that eat chicken droppings. She is an expert on everything worm, thanks to the hours she spends studying them, rescuing them, and racing them. Now, Winnie has a dilemma. She needs a new wagon, her efforts at repair being stop-gap at best. She’d love to win some prize money at the local fair, but there are no prizes for worms. Only for corn crops, chicken eggs, and puppy litters. No matter. Winnie also knows a thing or two about business. Look for a need and fill it. And, as the saying goes, if you can make money doing what you love, you will never have to work a day in your life. Winnie Finn is a great example of childhood ingenuity and resilience, as well as a role model for delaying gratification and setting goals. With her worm farm and her diligence, she helps her neighbours achieve their dreams, and then she shares in their success. New wagon, here she comes! Adding to the story and character building, the illustrations by Ard Hoyt are cartoony and quirky. He fills in the gaps that must be left out from a picture book manuscript, such as the fact that Winnie’s parents own a flower shop, and that Winnie isn’t all tom-boy. She likes a bit of bling too. Plus, Ard likes to put a few sight gags into his work, letting Winnie’s cat provide some background comic relief. 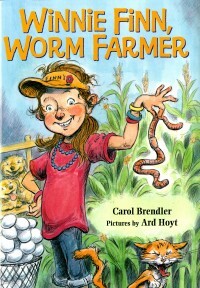 Winnie Finn, Worm Farmer was selected for the 2014 Illinois Reads literacy initiative. Carol Brendler is also the author of Not Very Scary, and the novel Radio Girl. Check out her web page. Not plain, yet simple, this book is FUN! 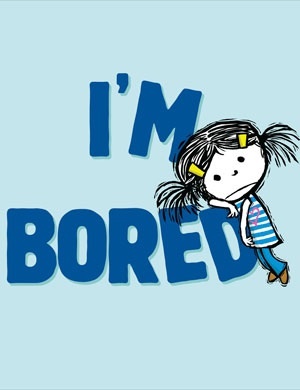 A little girl, let’s say a precocious 4, beautifully rendered with simple wood-cut lines, is bored, bored, bored, blahhhhh, bored. And so is the disagreeable potato she has befriended. “What do you like to do?” asks the little girl. 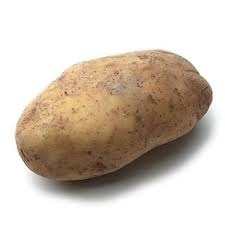 The potato makes a suggestion. But, seeing how flamingos are scarce, she must do her best to entice the spud with other distractions. She demonstrates games and tumbling, to no avail. So she must resort to her imagination. Finding the ballerina and lion tamer banal, the starchy little antagonist goads the child on, each new page turn revealing more and more elaborate scenes that fill with detail, colour, and emotion, until she’s HAD IT with the tuber’s bad attitude, and storms off. Dynamic use of text layout and vibrating line work make this picture book a funny and entertaining read, but the funniest bits come from the incorrigible potato. I’m big on cross-curricular integration. The Ontario curriculum is huge, with more than I feel is possible to cover in any meaningful way. And I hate gym. So, if I can kill cover as many birds as possible, yay for me. Here is a game I call Don’t Throw Your Junk in My Backyard (after the song), and some ways to integrate math and physical activity. Have the class divide itself into 2 or 4 groups, each team getting a half or a quarter of the gym. 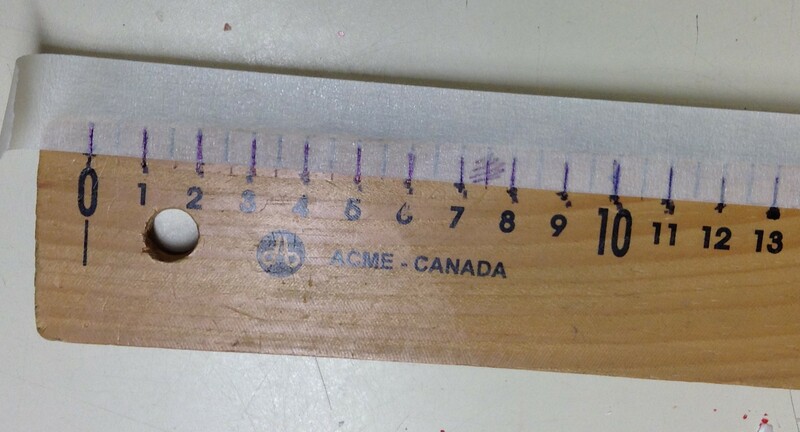 Or you can divide them, unevenly, and see how fast they figure out about equal division and same sized fractions. Put out “Junk,” which is any piece of equipment that can be lobbed from one side of the gym to the other, safely, such as bean bags, soft balls, foam frisbees, etc. Have a fixed amount that can be shared equally among the groups. Blow the whistle and have the students pick up and lob or slide (whatever you feel is safest – unless you enjoy filling out insurance forms) the “Junk” from their side to the other team’s side. Give a time limit and blow the whistle again when the time is up. Have each team count the “Junk” in its yard. Get ideas for the fastest way to count these, so they can GET ON WITH THE GAME ALREADY! Determine which team has the least “Junk” And how much less (many pieces fewer). Working with a friendly number, like a ten, or even 100 can build number sense. Discuss the winning team’s strategies for clearing their junk quickly, and challenge the other team to incorporate those strategies next round. Posted in: Education, Mathematics, Phys. Ed.